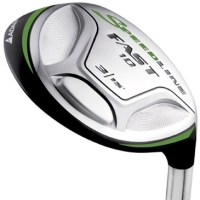 The Speedline FAST 10 delivers easy-to-hit shots with maximum distance. This new generation Speedline FAST 10 Fairway Wood features precision milling for exacting design specs, optimized center-of-gravity and premium aesthetics. The sole camber was also increased for playability from all lies. Precision milled for exact design specs and optimized CG. • Standard model: Weight pad is positioned back. Neutral ball flight. • Draw model: Weight pad is positioned in the heel. Draw biased ball flight. Sole curvature and shaping delivers a 57% increase in camber and provides more consistent ball striking and playability on all lies.